Jancis - Pale coppery gold. Gosh, amazingly developed and surely a little oaky on the nose. And then extremely refreshing on the palate - much more so than the nose suggested initially. Very dry finish - a substantial, muscular wine! Wine Spectator - There's a sense of quiet elegance and grace to this harmonious Champagne. Refined and lacy in texture, with finely wrought acidity lending focus and length to the spice- and graphite-laced flavors of ripe apricot and blackberry, lemon meringue pie, chopped almond and briny mineral. Suckling - Fabulous aromas of dried apple, cream, mango and ginger follow through to a full, dense palate, but it's very, very fine. The bead is so, so fine. The texture is like silk. Truly superb quality. I love the contrast between richness and freshness. It builds slow on the palate and finishes so long and rich. This was 10 years on the lees. Mostly pinot noir. So superlative to drink. This follows 2000, 1999, 1996 and 1995. Other - Light yellow-gold. Deeply pitched aromas of poached pear, fresh fig, orange custard and honey, with smoky mineral and buttered toast nuances adding complexity. Stains the palate with ripe citrus and orchard fruit flavors that are given spine and focus by juicy acidity. Closes taut, sappy and extremely long, with an echo of toastiness and wonderful clarity. All Grand Cru fruit. Lyons - The first impression of this vintage is one of extraordinary ripeness. This is a concentrated and ripe wine with citrus notes that bounce off a layer of fresh toast and brioche. It has a long, persistent finish with bright acidity. 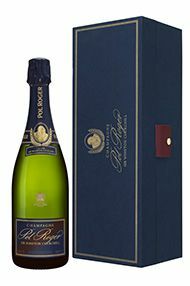 Pol Roger is perhaps best known as Winston Churchill's favourite Champagne. 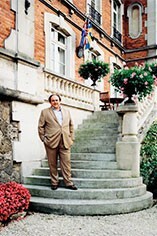 The house remains family-owned and has a reputation for producing champagnes of finesse and elegance which age very well. Pol Roger Brut Rèserve Non-Vintage, made from equal parts of Chardonnay, Pinot Noir and Pinot Meunier, is consistently one of the very best on the market, largely due to the high proportion of aged reserve wines in the blend. Pol Roger vintage wines, made from at least 60% Pinot Noir and up to 40% Chardonnay, are soft and fruit-driven in youth but, after ten years or so, develop great complexity and finesse. The Cuvée Sir Winston Churchill, launched in 1984 and made from a secret blend, is a Champagne of exquisite finesse and balance and one that rivals the very best of the region.